Course Aims: The CPCS A14 course aims to provide the candidate with a thorough practical and theory training in operating a Rough Terrain Forklift in order to to enable the candidate to pass the CPCS Theory and Practical Tests. Undertake all pre – use checks. Configure and ready for travel. Travel over rough, undulating ground, steep inclines and level surfaces (with and without loads). Maneuver in confined spaces (with and without loads). Configure and set for lifting and transferring duties. 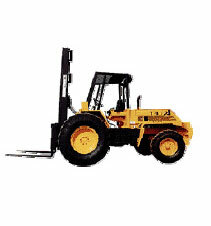 Lift and remove various loads up to full working height of the forklift. Transfer and place loads accurately at given locations. Place and remove loads from a vehicle. Explain the loading and unloading procedures for machine transporting.